As a homebuyer, initial considerations before purchase are the importance of location, floor plan, and solid construction. A recent report from Barclays has presented a new addition to consider. According to analyst Stephen Kim, the forty-year trend of bigger is better is over, as smaller homes are becoming the preference for the majority of American home buyers. Kim believes we’re in the early stages of a major housing shift that will continue for the next several decades. The Tiny House Movement is an inspired and intentional form of extreme downsizing. So, what is considered a tiny house? Believe it or not, these pocket-sized dwellings have a rather strict system of classification. Square footage can be no higher than 400 and as low as 70 to be considered a tiny home by the American Tiny House Association. If that’s too extreme and you lean more towards modest than sparse, you can choose a small home, which is considered anything between 400 and 1,000 square feet. The typical size of average American house is 2,600 square feet, for perspective. The two groups of homebuyers are driving this change; Baby Boomers and Millennials. Boomers who lost equity during the Great Recession are now in a good position to sell their homes and downsize, as the market is fully stabilized. Millennials’ main interest is location; they’d rather choose a smaller home in or close to a city as opposed to a larger suburban home. Smaller size doesn’t always mean a smaller price tag, though, as many are well-appointed homes, with many costly upgrades like countertops, flooring, and appliances. A lot of potential homebuyers still have the bigger is better mindset, but it may be worth rethinking how much size you truly need. Many homes have formal living and dining rooms that are used only a couple of times a year, as an example. With a tiny or small home, you can use your money towards flooring, countertops, and fixtures for a smaller home, rather than using your buying budget for what becomes unused spaces. You’ll enjoy the amenities while you live there, and have upgrades already in place should you choose or need to sell. One of the most cited reasons people choose a tiny home is their desire to create a more sustainable lifestyle. These micro-houses have been proven to be energy efficient for numerous reasons. Because they are so small, tiny houses require much less energy consumption overall: heating, cooling, and lighting a small space is always easier than keeping up with a sprawling layout. Tiny houses with solar panels have an even smaller carbon footprint. Home sizes in the USA have spent four decades growing to incredible sizes. Despite a decrease in the average size of an American family, between 1978 to 2013 the average size of a single-family home grew from 1,780 square feet to 2,662. This means that while families shrunk by about one person, home size has grown by almost 50%. This marked increase in size was not due to necessity, it was as a luxury and a sign of privilege and wealth. 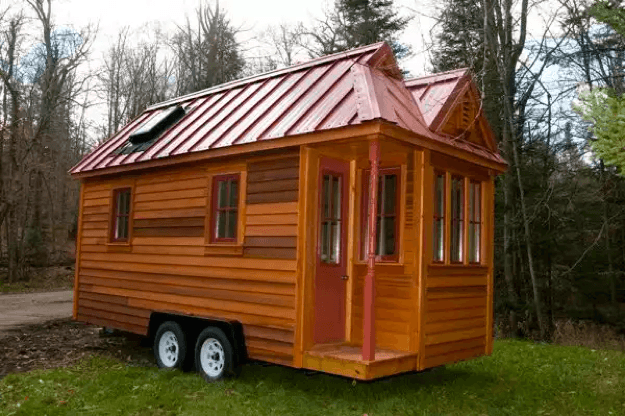 The Tiny House Movement, as a pushback against a perceived culture of excess, has been cited as a sort of small-scale rebellion against a culture of materialism. Reduced upkeep is probably the most obvious benefit of a tiny house. If you have only 400 square feet, there’s only so much clutter you can accumulate and so much space to make a mess in. Dusting, vacuuming, and sweeping will take a fraction of the time. Any repairs will also be on a reduced scale, ensuring they stay smaller in cost for the most part. Repairing a tiny roof, rather than one covering a 2,500 square foot home, is a much less daunting task. In the tiny home community, the popularity of tiny homes on wheels has been growing rapidly. Though often compared to glorified RVs, these tiny houses are more like traditional homes on wheels. The owner then has the freedom to move residency at any time. This is a huge perk, especially as many owners of tiny homes often cite self-sufficiency as one of their biggest reasons for going tiny. Many of these homeowners also live debt-free without a mortgage, meaning more disposable income to travel or pursue hobbies and interests. Overall, the folks who own wheeled tiny homes are less tied down to the traditional neighborhood or way of life. Many love the idea of a tiny house, but others don’t desire to restrict their total living space to only 400 square feet. Many families around the country are finding other uses for these petite dwellings. They can become an add-on to an existing home, a guest house, a home office, a studio, or a space for an aging family member to still live independently but close by. 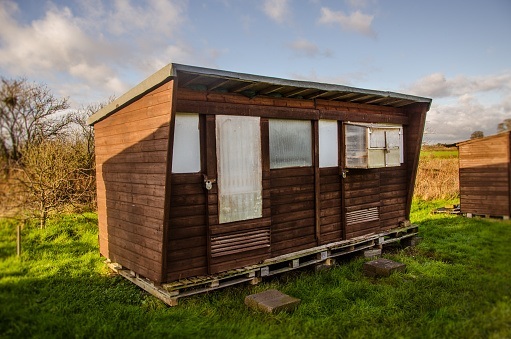 How much more cost effective really is a tiny home, you might be thinking. The average cost of a home in the USA is $150,000 – 300,000, while the average tiny home costs about $27,000. Due to this reduced cost, most tiny homeowners are mortgage-free, as they pay cash up front. Even if they obtain a mortgage, the loan is so much smaller so it’s easier to pay off faster. Insurance and taxes are significantly lower as well.